The light at the end of the tunnel was not on the PS2. It was once again on the PC for me. And that light was shining brightly from the developers at Bethesda. Though I had never played Arena, Daggerfall, Battlespire, or Redguard, The Elder Scrolls had finally caught up with me. Morrowind blew into the stores, and I knew it was going to be big. It was during the school year, and I knew that I could not get it just yet. I knew, even before I had played the game, that it would consume me. I could not afford that in the middle of a semester. I bid my time and when summer came I finally got the game, and was in the clear to play it. I was not wrong. I was also very wise to wait till summer to get it. Morrowind was like love at first sight. It was my rabbit hole. More immersing than anything before, Morrowind took the hours from me without my being the wiser. I still remember the first day, when I started the game. I created my character and started to try and figure out what the heck I was supposed to do and where I was supposed to go. By the time I had gotten to the next closest town, Balmora, almost six hours had passed. It went by so fast, I couldn't believe it. Where had that time gone? I had no idea, but this would be an occurrence that would repeat itself time and again. I would sit down to play it, and suddenly half the day was gone. Morrowind was a time warp. For me, this remains the most immersing game of all time. You can do anything, and go anywhere. 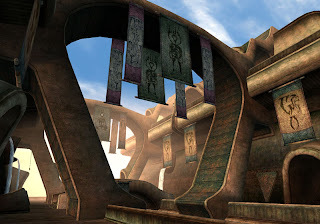 This complete openness in Morrowind made for an incredible story for me. Over 400 quests made the experience very unique, as I would just go and get caught up in them, ending up who knows where. Morrowind was my love for about two years. I don't know that I have ever played a game for that long. In the end of my reign over the land of Morrowind, I still had the same character. Nothing existed in that game that could withstand my mighty sword, and I was playing on maximum difficulty for some time by then. Two expansions and countless downloadable content mods online fueled my thirst for more Morrowind. It was a mighty wind indeed. As hard as it is to imagine, I had finally exhausted the possibilities in Morrowind. It was at last time to put it to rest, and find something else to play. Something else to get obsessed with. Luckily, or perhaps unluckily, it didn't take very long to find the next great story in a game. The console games still had me wanting in that department, so I kept to the PC games. I was about to be reacquainted with an old franchise that I, as any respectable nerd, had always been fond of. Star Wars is the name. Granted that the gaming market has been somewhat over-saturated with Star Wars games, but they are not all bad. 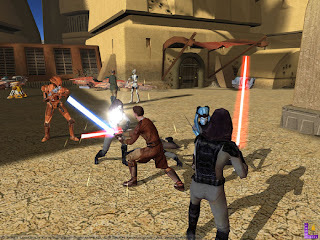 My new love was Star Wars: Knights of the Old Republic. I believe that anyone who has played it will attest to the power of its dynamic story. 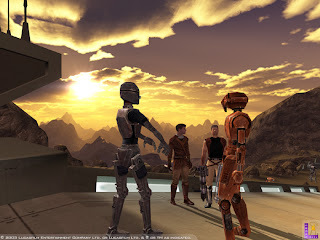 KotOR introduced something not really seen before in a game's story, at least not to that extent. Each quest would give the player the ability to follow the path of light, or darkness. You had the option of being good, or being bad. This would ultimately change the outcome of the game, where you became a good Jedi or a Dark Jedi. Each choice would either give you Light Side Points or Dark Side Points. Once more I was so taken by the story of the game, that I was powerless to get away from it. Put another one on the finished list. During this PC craze I also managed to pick up copy of Gothic for a great price. The game went down to budget prices all too quickly, but I suppose that was good for my wallet. 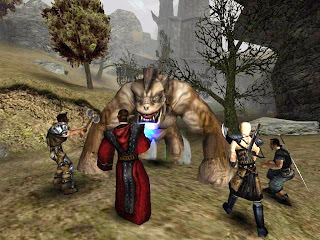 Along the lines of Morrowind, Gothic had a great expansive world and a comparable difficulty level. I prefer the types of roleplaying games that are more challenging, as long as they give you the option to run away! 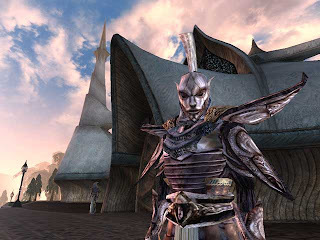 Though not quite on the scale of Morrowind, Gothic presented you with three different factions to side with, and that in turn would give you a different ending. This generated a variable experience for the player, and more so due to having to move up in rank in each of the factions. Having to choose a side also makes for interesting personal dynamics for me. As far as the effects in game, choosing one faction also determined how the other factions reacted towards you. Seeing as how I'm all about variable game experiences by this point, Gothic was another fantastic addition from a less known game developer out of Germany. An honorable mention should also go to Arx Fatalis. This game had for me a great nostalgia factor. It was a modern style RPG in first person, yet it had the feel of an old dungeon crawler like Eye of the Beholder. Mixed in with that was a good story and great gameplay, along with well done visuals. 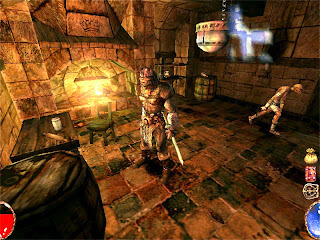 The developers did intend for this game to have that nostalgic flare because "Arx Fatalis was intended to be Ultima Underworld III, however they could not obtain a license for the UW name" (Wikipedia article). I finished this one too, so that must mean it was quite good. Right? Somewhere during all of this I was talking with a friend of mine about great classic games, and he brought up System Shock 2. I had actually never played the game, and when I told him that it was all he needed to hear. The next time I saw him he had found his old copy of SS2 and told me to take it home and play it. Little did I know what I was getting myself into. System Shock 2 is entirely unique in the experience that it provided me with. Never before, or since then, have I loved and hated a game so much and all at the same time. The reason for this was the story. It was gripping, to the point where I played the game just to find out what the hell was going on. I hated it, because it had me scared and on the edge of my seat the whole time while playing it. It was so eerie. Especially the “midwifes” and when they’d say “oh the little ones, they grow up so fast…” Because you knew when you heard that sound that you were in for a beating. But I loved the game also because of the fantastic story, ambience, and atmosphere it created. I just couldn’t stop playing. I had to find out what happened there. And when I did, when at last I had defeated the true cause of all this terror, I was jubilant. I rejoiced for having overcome the game’s obstacles, and I rejoiced because I knew I didn’t have to play it anymore. I vowed never to touch System Shock 2 again. Following such an intense experience, my gaming and game enthusiasm ebbed slightly. Things were happening in my life that took precedence over game obsessions, and I had quit working at the game store. Our wedding came before my gaming needs, and took a fair amount of time out of our days then. Soon after we readied ourselves for and made the big move east. In summary, the games which get the prestigious Mentis Award for Storytelling are The Elder Scrolls III: Morrowind, Star Wars: Knights of the Old Republic, Gothic, and System Shock 2. Honorable Mention goes to Arx Fatalis. In the next part of my completely subjective game awards, I'll be exploring the next generation of underdogs and the gems that never came into the limelight. Stay tuned!